For many families, summer is the ideal season for stargazing– the kids are out of school, the weather is beautiful, and everyone seems to be staying up later and sleeping in. Stargazing is for EVERYONE and ANYONE can do it! 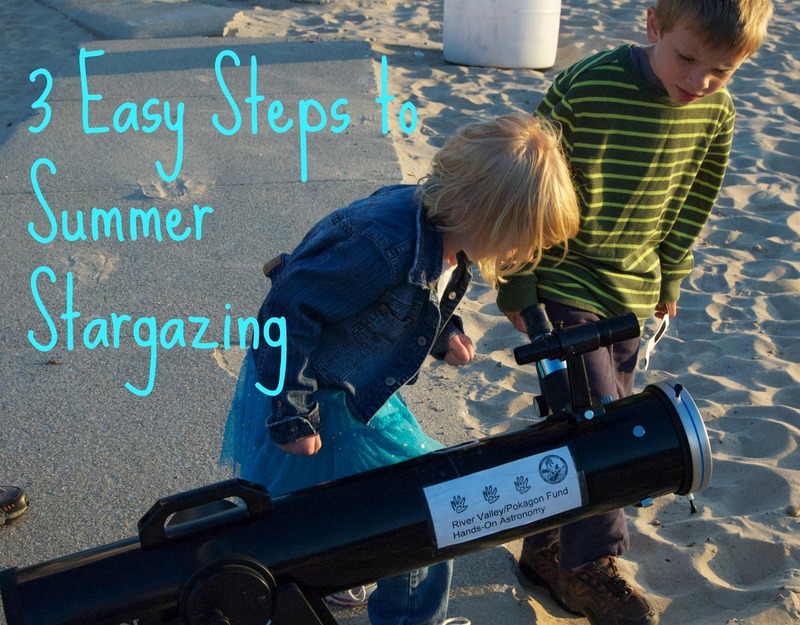 Here are three easy steps to successful stargazing as a family. I know that this one seems like a no-brainer, given the name of this website, but the biggest reason that most families don’t stargaze is just simply because they don’t take the opportunity to look up at the sky together. In the Stargazing with Kids section, you will find a lot of information about how to set up an ideal time and location for stargazing as a family, but don’t let a lack of planning stop you! Anytime that you are outside as a family you can take a moment to look up at the sky and discuss what you see. Have you ever found yourself pulling into the driveway after a family outing, and as you leave the car you notice that it is a perfectly clear night and a million stars seem to be shining? Why not take 15 minutes to lay out a blanket and gaze up at the night sky as a family? These are the experiences that will spark a love for the stars in your children, and they will remember these impromptu stargazing sessions forever. The best summer constellation for children to find in the sky is the Big Dipper. If you can find this in the sky and show it to your children, that is just about all that you need to know to get started. 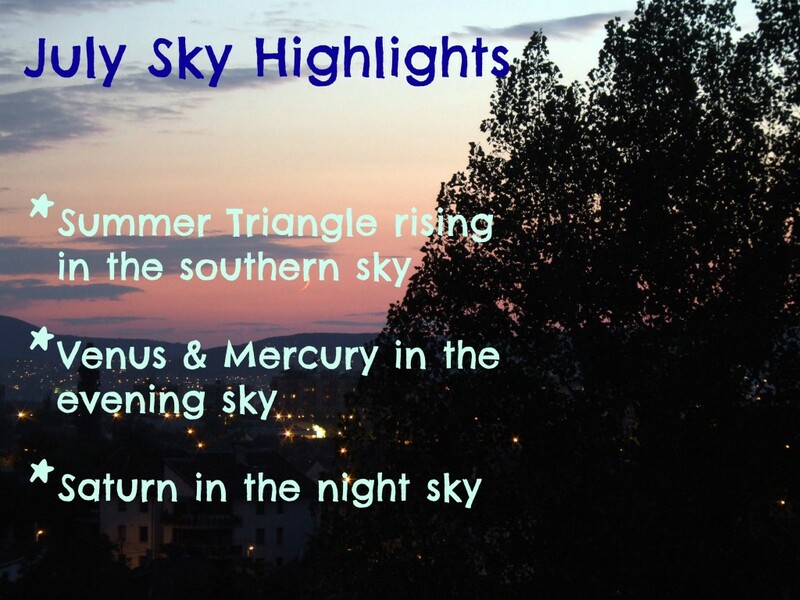 For more background, check out the Stargazing Basics section and What’s Up in the Sky This Month. You can also talk about the similarities and differences that you see in the stars. Are they all the same color? brightness? size? distance from Earth? How is our Sun like these stars? How is it different? See if you can locate the three brightest stars in the southern sky, that form the Summer Triangle (print off the Summer Sky Map for help). 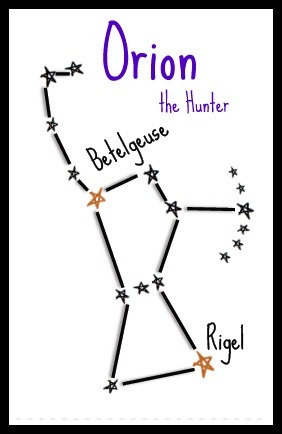 Ask your children what they know about the stars and which constellations they have heard of. If you ask these types of questions, you might find your children asking you to find out the answers, or looking up the answers on their own! Our imaginations are what make stargazing accessible to everyone. Even if you can’t locate a single constellation in the sky, you can do what the many cultures before us have done, and find your own constellations and write your own stories. Ask your children to connect the stars to make a constellation and ask them to tell you a story about it. Imagine yourselves alive thousands of years ago, before technology and telescopes. What would you think that the stars were made of? How would you imagine that they came to be? Everyone can pick a star that they’d like to visit– What would you find there? Would there be planets there like the Earth? How long would it take you to get there? How would you travel? Stargazing as a family really is an easy activity for everyone to participate in. You don’t need any special equipment, nor do you need a PhD in Astronomy to teach your children to appreciate the night sky. Be sure to take the time this summer to lie back and look up. 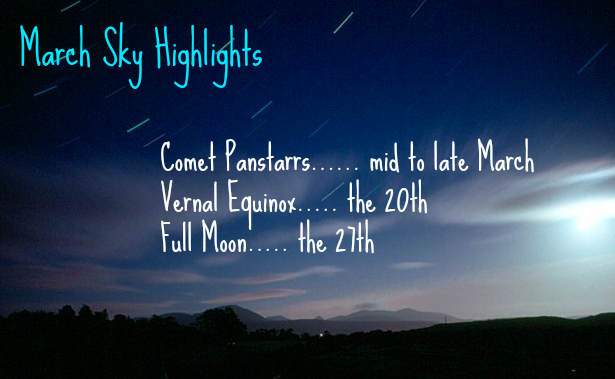 Check out our What’s Up in the Sky this Month page for an idea of planets and constellations to view in March. Don’t forget to print off the free Winter Night Sky Map as well! 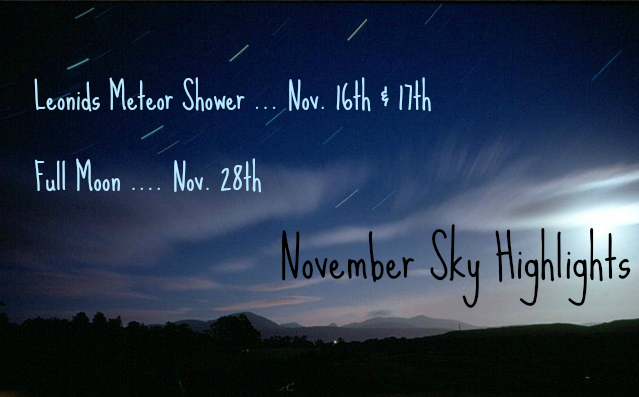 Get ready for a wonderful sky event this week! 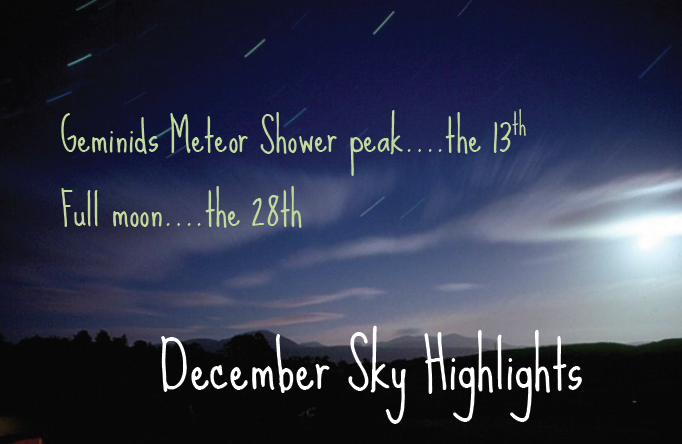 While the Geminid Meteor Showers will be active between the 4th and the 17th, they will peak on Thursday night (the 13th). Look towards the Gemini constellation in the southeastern sky for a wonderful show. 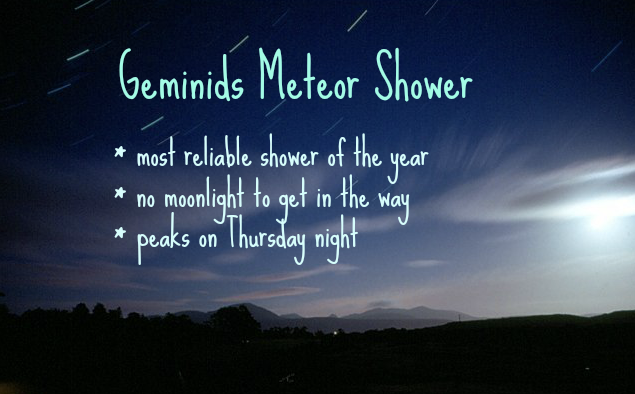 The Geminids are considered to be the most reliable showers of the year, and this year we are in for a treat since there won’t be any moonlight to distract from the shower. The Geminids are one of the only meteor showers not caused by comet debris. The beautiful showers are caused by an asteroid with a comet-like orbit around the Sun. To make this a family stargazing event, don’t forget to prepare ahead of time! Set up a cozy spot in the yard, have their stargazing diaries ready, and prepare a few snacks as a surprise. Let your kids stay up a few extra hours, or sneak in to wake them up in the early hours before sunrise, and tell them to grab their jackets and hats. Be sure to have your stargazing playlist ready to go! Check out our What’s Up in the Sky this Month page for an idea of planets and constellations to view in December. Don’t forget to print off the free Winter Night Sky Map as well! As the holiday season descends upon us, it’s time to start thinking about gift giving. And if you are like me, I get tired of buying the same old socks and scented candles for friends and family members. This holiday shopping season, consider these affordable, unconventional gifts– appropriate for seasoned astronomy enthusiasts and young stargazers alike! 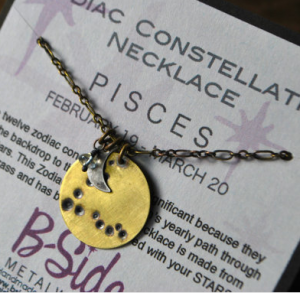 A Zodiac Constellation Necklace makes for a great gift for mothers! You can show that special someone in your life that you are thinking about them by buying them this beautiful necklace with their zodiac constellation stamped into it. Mothers love to have a little memento reminding them of their children– consider buying a charm with each child’s zodiac constellation and put the charms together onto one chain. 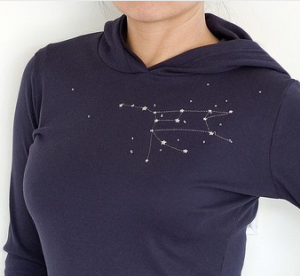 This stylish hoodie with Ursa Major embroidery is the perfect way for her to show off her love of the constellations. This shop has several other types of clothing with constellation embroidery– all stylish and comfortable looking. This 2013 Desk Calendar would look great on a bulletin board or posted on the fridge. 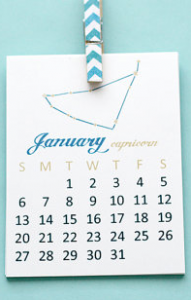 Each calendar has a beautiful sketch of a zodiac constellation. Don’t forget to circle the important dates in astronomy for the upcoming year before you wrap it! 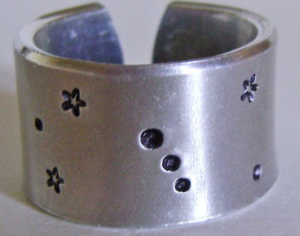 A custom hand-stamped constellation ring is an elegant choice for the astronomy-loving woman in your life. You can choose any constellation, and this gorgeous ring won’t tarnish! 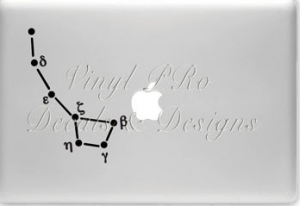 The Ursa Minor Constellation Decal is a great gift for men and women alike– and you don’t even need to put it on a computer! It also works on car windows or any other smooth surface that might need some livening up! 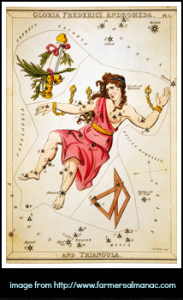 A Vintage Constellation Chart is the perfect gift for the guy who loves all things astronomy and all things vintage. The 8×10 size is perfect to hang in a den or office. It’s a beautiful reproduction, so you don’t have to worry about it falling apart. 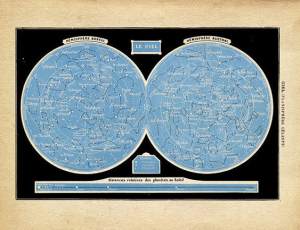 The constellation chart shows both the northern and southern hemispheres, so it’s a great gift for anyone in the world! 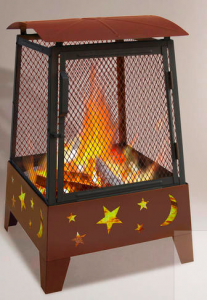 A Stars and Moons Fire Pit looks great to cozy up to on a chilly night. It would add a celestial touch to every backyard campfire, and set the stage for stargazing! What better way to tell the guy in your life that you’d love to spend some cozy nights stargazing around this beautiful fire pit. This custom leather luggage tag is absolutely beautiful. 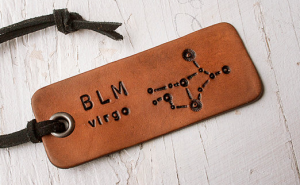 You can have the artist custom stamp his initials, and even customize the constellation! There isn’t a more thoughtful gift for the astronomy-loving guy in your life. 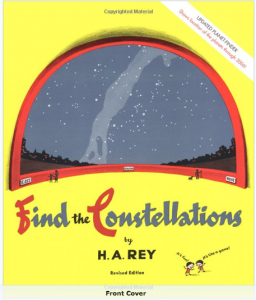 Here is THE BEST constellation book for kids and adults alike. By the famous creator of Curious George, this book does an amazing job of pointing out the constellations with very easy-to-understand drawings. Every child should have a copy of this book! 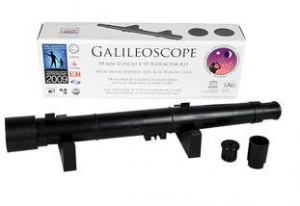 This is a great low-cost telescope kit for beginners. The Galileoscope allows kids of all ages to build and observe with a telescope similar to (but much better than) Galileo’s. Thirteen year-olds can assemble this with supervision, and younger children with adult help. The process of building the scope is beneficial in itself, and then at the end you have a great beginning telescope to use! It helps to have a tripod to attach the scope to, and then you can enjoy gazing at the moon or Jupiter! Tickets to your local planetarium make a great gift for all ages. Take the time this winter break to visit a planetarium near you! Planetarium trips are especially fun for those of us in the Midwest during the winter season– the cold weather can make stargazing sessions a little tricky. You will usually find that tickets to a one-hour show are very reasonably priced. There are many books out there with astronomy themes– fiction and nonfiction alike, for two year-old and twelve year-olds. 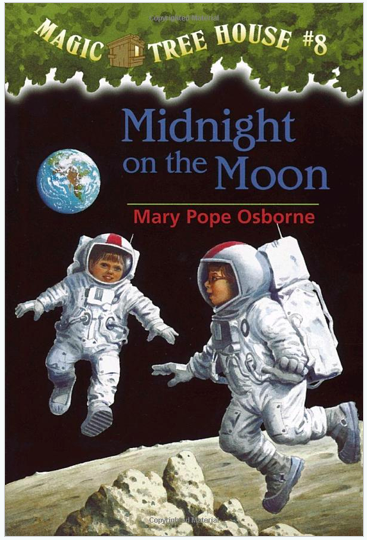 You can foster your child’s love of reading and of astronomy with one gift! The Orionids meteor shower will peak on the nights of October 20th and 21st this month, as the Earth passes through the debris from Halley’s Comet. 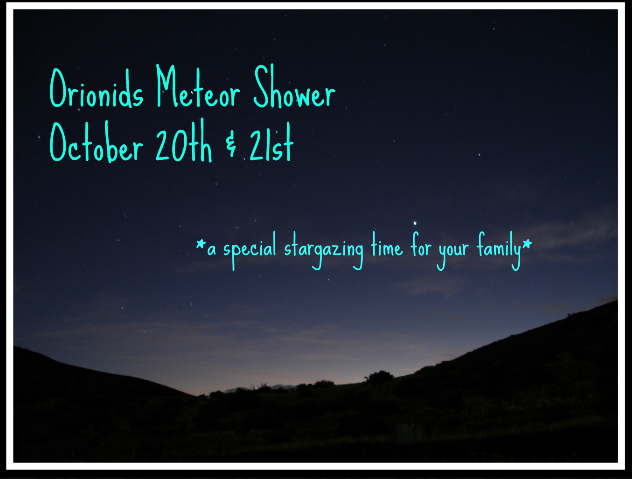 With this shower occurring on the weekend, it is a great opportunity to stargaze as a family. This meteor shower will originate from the Orion constellation, which you can find in the southeastern sky late into the night. The best time to view the meteors will be between midnight and dawn, with peak viewing in the hours just before dawn on the 21st. While this early morning viewing time isn’t for everyone, it is a great chance to make stargazing a very special time for your family. Be sure to get your children to bed early on Saturday night, and then wake them in the pre-dawn hours for this special chance to see some “shooting stars“. 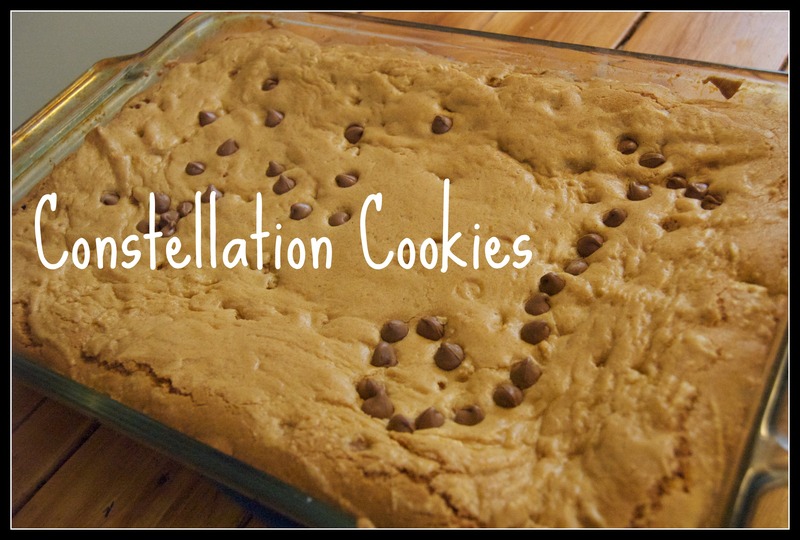 Set up a cozy spot in the yard, have their stargazing diaries ready, and prepare a few snacks as a surprise. Sneak in to wake up your children in the early hours, while it is still dark, and tell them to grab their jackets and hats. Be sure to have your stargazing playlist ready to go! The sky is full of constellations based on myths and legends from ancient cultures throughout the world. This is one reason that stargazing is important for children, and also something that makes it fun for them. The fall sky is full of a cast of characters from one of these ancient Greek myths. Cepheus and Cassiopeia, king and queen of Ethiopia, had a beautiful daughter named Andromeda. While she was one of the most beautiful young women in all the land, Cassiopeia was sure that she was the most beautiful of all. Queen Cassiopeia, being a proud mother and boastful queen, declared Andromeda to be more beautiful than the nymphs of the sea. This greatly angered Neptune, the god of the sea. In his anger, Neptune sent a horrible sea monster to ravage the coasts of Cepheus’ kingdom. The only way that Neptune could be satisfied was for Cepheus to sacrifice his daughter to the horrible sea monster. Andromeda was thus chained to a rock in the sea, to be sacrificed to the monster. At this time, Perseus was passing by after having killed the horrible Medusa. This great hero saw the beautiful princess chained to the rock. Perseus agreed to kill the monster in exchange for Andromeda’s hand in marriage. Cepheus and Cassiopeia agreed to this, and the great hero swiftly killed the monster and freed the princess. Perseus and Andromeda lived happily ever after, and all four characters (Perseus, Andromeda, Cassiopeia and Cepheus) are immortalized in the fall night sky. 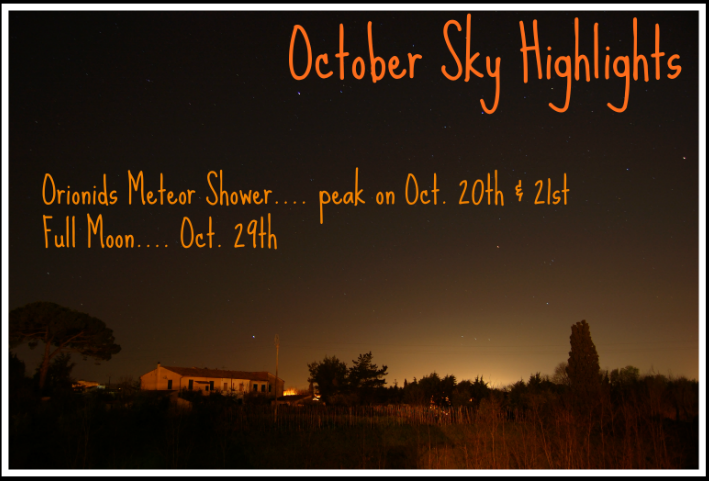 Check out our What’s Up in the Sky this Month page for an idea of planets and constellations to view in October. Don’t forget to print off the free Fall Sky Map as well!